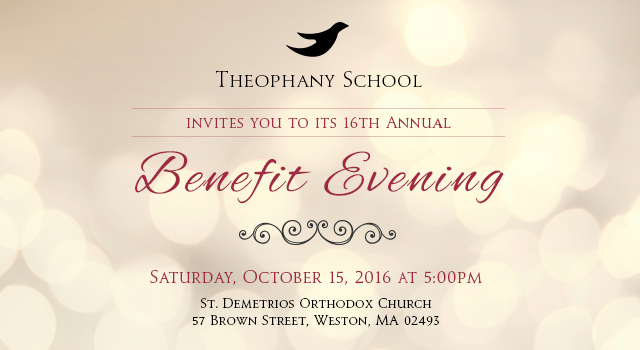 We are pleased to announce our 16th Annual Benefit Evening! This year’s event will take place on Saturday, October 15, 2016 at St. Demetrios Orthodox Church in Weston. Join us for cocktails, dinner, and a silent auction as we recognize our co-founders and welcome our Guest of Honor, Reverend Nicholas C. Triantafilou. Thanks to the support of so many, last year’s event was a great success. We ask that you support our efforts this year by attending the event, becoming a sponsor, or by making a donation. An Eventbrite button is provided below for you to reserve a seat, a table, or make a donation toward this year’s event. We also need event sponsors and/or items to offer as prizes for our silent auction. Your sponsorship and donation will help us to achieve our goal for this fundraiser. Theophany School is philosophically committed to low teacher/child ratios, affordable tuition, and teaching excellence. In order to keep this commitment to our children and their families we hold an annual Benefit Evening with a goal of raising $50,000. This affair helps to ensure that we are able to continue our work with children. Approximately 300 guests are expected at this event. This year Theophany School is celebrating nineteen years of educating young children from the Boston area. We provide young children with an opportunity to learn while respecting individual learning styles, emphasizing social skills and emotional skills and emotional health, and promoting self-expression through various activities. Alumni parents return to tell us how their child’s preschool and kindergarten education prepared them to excel in all aspects of their continued school experiences.